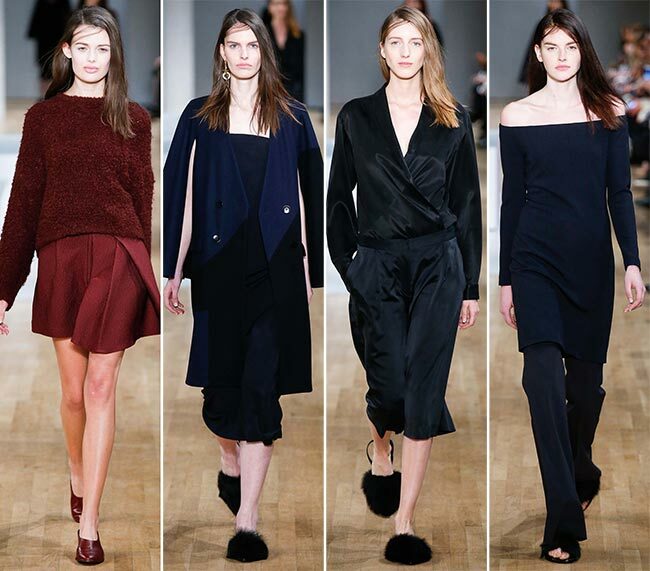 Cozy, warm, simplistic‚Äö√Ñ√∂‚àö√ë¬¨‚àÇ The new Tibi fall/winter 2015-2016 collection has all the characteristics	to become one of the most inspirational fall 2015 fashion lines with wearable and comfortable clothing pieces and accessories. Amy Smilovic looked to the Inuit culture for inspiration, creating perfect winter-ready clothing pieces that celebrate warmth and comfort. “There are a lot of long, lean silhouettes mixed with coziness,’ she stated backstage before her amazing show at New York Fashion Week yesterday night. 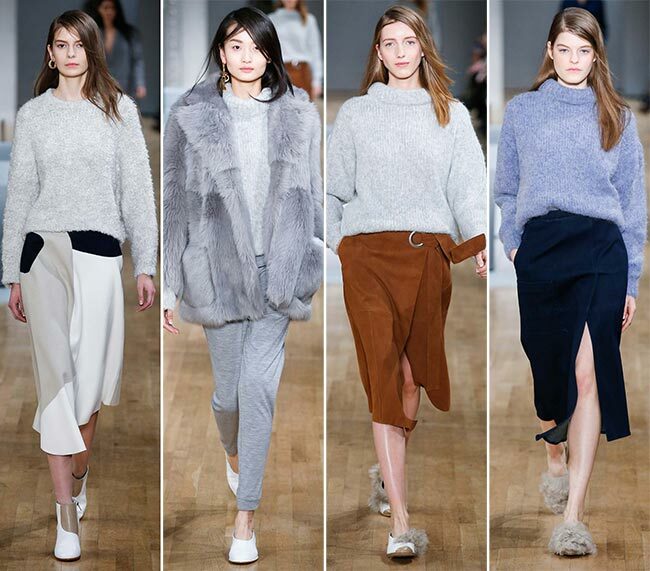 Her fall creations focus on a mild color palette and amazing textures that you’ll long for winter to be able to wear. 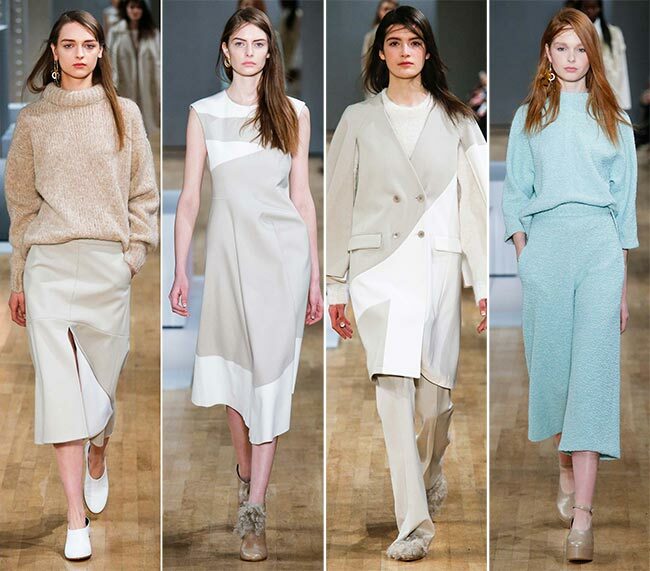 The soothing color palette of the Tibi fall/winter 2015-2016 collection reveals the Arctic influences over the designs, as we discover lots of soft creams, whites and pretty pastels followed by the timeless navy blues and marsala wine shades that will look so perfect on the backdrop of the autumnal nature. “It’s about wearing 12 shades of navy or five shades of burgundy. It eases up your wardrobe choices if you can just mix it up,” Smilovic explained her choice of the wonderful color palette. We see head-to-toe monochrome looks, and there is absolutely no room for prints and patterns. The designer still managed to inject a big dose of attitude and interest into her simplistic designs through unexpected fabric combinations that gave so much texture to the looks. The very first huge trend we notice from the very beginning of the show is the culottes, which have high waistlines and flared silhouettes being perfectly juxtaposed with the absolutely insane fur-trimmed flats. 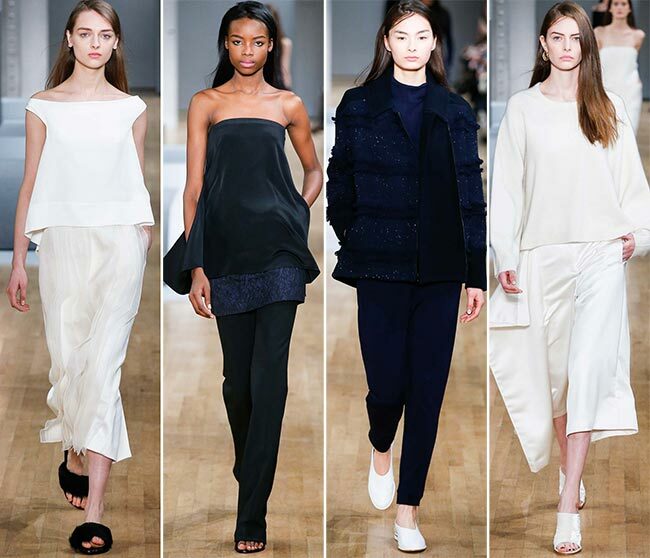 It’s not just the colors and styles that the Tibi culottes stand out with, but also the vast variety of the materials used, ranging from the iconic denim and wool to jersey. 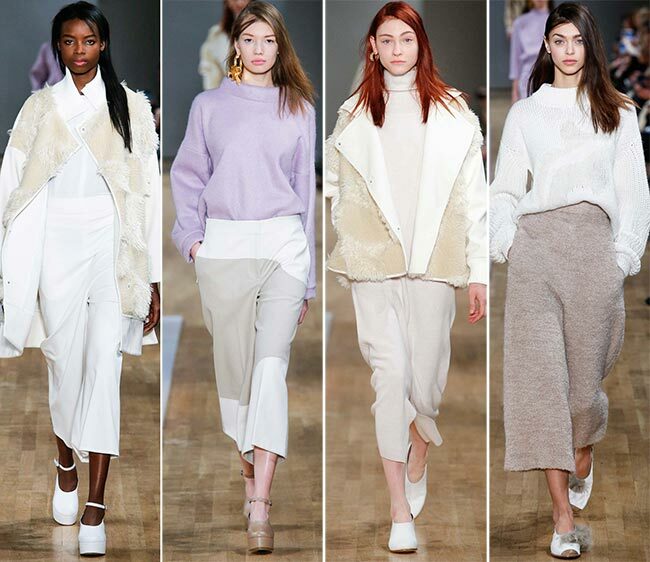 They come teamed with off-the-shoulder knitted sweaters, simplistic tops utilizing the same colors and materials as the pants and chic oversized shearling and mohair coats. 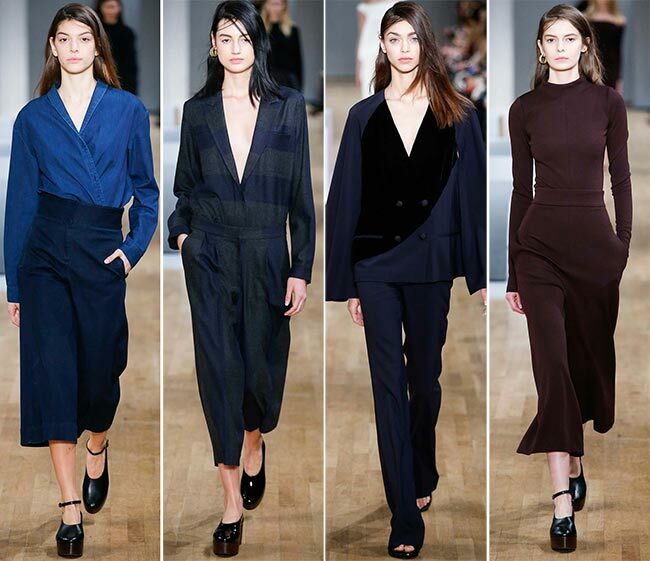 If it’s not pants and culottes, than it’s skirts cut at the tea length and sometimes featuring high slits, which still manage to preserve the overall style and length of the Tibi fall/winter 2015-2016 collection. There are just two looks that instantly pop up amidst the balanced lengths, being short and looking so fresh and youthful. Available either in black or burgundy, that’s a lovely look featuring a warm oversized mohair sweater and a pleated skirt matched with leather shoes in the same tone as the entire outfit. Alongside the soft fur and shearling coats and jackets, the mohair sweaters, sweatpants and skirts, the Tibi fall/winter 2015-2016 collection manages to offer something cool for eveningwear as well, particularly monochrome two pieces featuring strapless designs, creative shapes and elongated forms. Like the daywear looks, the evening-worthy ones as well come accessorized only with statement-making shoes being so summer-appropriate in their style, still having the overall warmth and softness as the clothing pieces thanks to the fur details applied. Wholly, it’s a super cozy, wearable and minimalist collection that will feed into the wardrobe needs of every modern fashioniser!